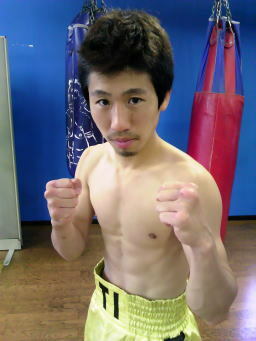 Looking through the Japanese fighters at Minimumweight we see a number of excellent fighters. The leader amongst those is of course unified world champion Katsunari Takayama whilst OPBF champion Kosei Tanaka isn't too far behind him. Behind the two elite talents is former OPBF champion Ryuji Hara, who himself looks like a potential world champion still. What those 3 fighters do is make the division look very top heavy and below them there is a lack in terms of talent and unfortunate Japanese champion Go Odaira (11-4-3, 1) is the prime example of that. Odaira isn't a bad fighter by any means but in terms of ability he is a long way behind Tanaka and Hara and came up short against Takayama on New Year's Eve, despite a great effort. Although Odaira did lose last time out to Takayama we see him return to the ring on March 26th when he looks to record the 3rd defence of the Japanese title and over-come mandatory challenger Yutaka Sowano (9-5-1, 6), a challenger even we know little about. Whilst we sound really critical of Odaira we aren't trying to be. In his own right he's a brilliant domestic champion, in fact he's a perfect domestic champion. He is well below world class but he's certainly not a bad fighter and he has the tools to dominate domestically for quite a while. In the ring Odaira is a little dynamo with a fantastic work rate, intelligent movement, sensational timing and brilliant speed, both with his hands and feet. What he lacks however is the power to make fighters respect him and the top class experience. That lack of power, just 1 stoppage win in 18 fights, is what limits Odaira as the rest of abilities are very good. On paper Sowano is a puncher with 6 of his 9 wins coming by stoppage. In reality however that's only 6 stoppages in 15 bouts and they'd all come against limited opposition with his best win being a 2nd round TKO against Kento Shimazu almost 2 years. What doesn't help us in regards to Sowana is that footage of him is relatively scarce as well with the only stuff we've stumbled on being highlights of his fight with Yutthana Kingtiger. From that footage it appears that Sowano is crude to say the least with wild and wide punches be the norm. Sowano has been beaten by much lesser fighters than Odaira and they've been able to take advantage of his flaws whilst being able to with stand his power. We suspect the same will happen here with Sowano's wild and telegraphed punches being countered by the sharp but light blows of Odaira. We know Odaira isn't world class but Sowano really has nothing to worry him here. This year has seen numerous new Japanese champions crowned. The first of those new champions was speedy southpaw Go Odaira (9-3-3, 1) who won his title on January 17th when he defeated Masashi Tada via a clear decision to claim the Japanese Minimumweight title. Odaira was thoroughly impressive in his victory over Tada as he bounced shots off Tada's head then bounced himself out of range, effectively leaving Tada chasing shadows in a career defining performance. Now, almost 5 months later, we see Odaira returning to the ring as he attempts to make the first defence of his title. In the opposite corner to the lightning quick Odaira will be another light hitting fighter in the form of Yuma Iwahashi (11-6-1, 1) who, although relatively unknown, has shared the ring with a number of credible fighters. The most notable opponents that Iwahashi has faced are Atsushi Kakutani, Kenichi Horikawa, Ryuji Hara and Wanheng Menayothin, all of whom defeated, Iwahashi who is a little bit fortunate to be ranked #1 by the JBC. Despite those losses however we have been impressed at times with Iwahashi who has developed into a decent, though not outstanding, fighter and given that his reported amateur record was just 3-2 (1) he is still very inexperienced. From what we've seen he's tough, brave and has solid movement early in a bout though he's unfortunate not to be gifted with much power though does throw some good combinations, sadly his opponents do tend to walk through them and they are often too few. Whilst Iwahashi is tough, and his only stoppage loss came way back in 2008 to Kakutani, he is very limited from what footage is available and unfortunately for him this will be a real issue against Odaira. Odaira himself is one of 3 fighting brothers, easily the most successful of the trio despite a poor start. Odaira turned professional back in 2006 and began his career 3-3-1 with one of those losses coming to Ryuji Hara. There was obvious talent there and his losses, on the whole, were very close but there was something missing. Since then however things have started to click for Odaira who is unbeaten in 8 fights and has a trio of notable wins as he has over-come Takashi Kunishige, Kazuma Kitahara and most recently Masashi Tada. What was missing for Odaira seems to have been found with a combination of experience and maturity and he has gone from being a nobody to being a Japanese champion and a man who looks very difficult to beat with a style similar to that of his handler Susumu Hanagata. Hanagata, like Odaira, was speedy, talented and light punching though had a great career that saw him beating Masao Oba and Chartchai Chionoi, defeating Chinoi for a world title. We're expecting a distance bout, they happen when neither guy really sits on their punches, but we're also expecting a bit of a mismatch with Odaira having too much speed, to much guile and too much aggression for Iwahashi who we think will look like a second class citizen in there. We think Odaira will be too quick on his feet, make the most of his southpaw stance and generally be too quick with hands and feet for the challenger who will be game but outclassed en route to losing a wide decision. We don't think Odaira will do as well as Hanagata did in his career but we'd be very shocked if he lost to Iwahashi here. Interestingly though there has been talk about Kosei Tanaka challenging the winner of this bout later this year. For those interested in little details this will be the co-main event at Dangan 103 with the other main event being the Japanese Super Featherweight title fight between the unbeaten Rikki Naito and veteran Kyohei Tamakoshi. All 4 of the main event fighters are featured on the poster above. The first Japanese fight of the new year comes just days after the first OPBF title fight. Whilst the OPBF fight, between Yoshitaka Kato and Masayoshi Nakatani looks like something special, we're unfortunately left with some less exciting for the Japanese title fight which sees the #2 and #3 ranked Japanese Minimumweights fighting for the vacant title. The belt, vacated late last year by Ryuji Hara, will see the light hitting Go Odaira (8-3-3, 1) fighting against the much harder hitting Masashi Tada (11-3-1, 7). We've got to admit that whilst both men are highly ranked it's not a bout that is setting our pulses racing. Of the two men it's Odaira, pictured above, that has been more impressive so far. Although he's not blown the world away with great performances he has been scoring the occasional note worthy victory, including a 6 round decision 2 fights back against former world title challenger Takashi Kunishige. What's notable about the victory over Kunishige is that he himself gave Hara a real scare just a few weeks back. As well as the victory over Kunishige it's worth noting that Odaira is on a 7 fight unbeaten run going back to his own narrow loss to Ryuji Hara. Other than the Kunishige win there is little of note on his record but the light hitting southpaw at least has that one notable victory. Whilst Odaira's victory over Kunishge is the most impressive between the two fighters it's hard not to be impressed by Tada's reputation as a puncher. Tada, pictured opposite, has yet to score a really notable victory, in fact it's hard to even come up with a semi-notable victory on his record. Despite that he has been fighting above the 105lb Minimumweight limit as he's searched for suitable opponents. Unfortunately despite the move to 108lbs and even 112lbs it's hard to say much about Tada's opponents. In all honesty the most noteworthy thing about them is that Tada was beaten by Junior Salvador, a very limited but tough Filipino. Albeit that bout was controversial and in the Philippines. Worryingly neither of these two men have been scheduled to go 10 rounds before. That may not sound like an issue but we believe it could well be with both likely to go into uncharted water. This may well favour Odaira, the boxer, who would be more likely to be to control his stamina for 10 rounds. Of course it's not out of the question however that he could be stopped by Tada. On paper it's not a bout that looks great but it is one that looks competitive. Not much more you could want in a bout. We do favour Tada, but only just. His power is likely to leave the more telling effect at least in the early rounds which we believe will see him building up a small but notable lead before Odaira comes back in to it. As well as the Odaira/Tada bout we expect a number of other contests on this show. These other bouts include seeing Takaomi Abe (15-2-2, 1), pictured opposite, fighting the big hitting Kazuya Nakano (6-2, 6) in a very good looking contest, Hiroaki Teshigawara (8-1-1, 4) battling Yuta Nakagawa (11-4-1, 7) and a potentially brilliant clash between Kohei Kubo (16-4-1, 11) and Hayato Kimura (20-5, 15). We really wouldn't be shocked if the Kubo/Kimura bout ended up being the show stealer as it looks really good on paper. This show will be held at the Korakuen Hall on January 14th. At the moment we're unsure who the promoter is though as mentioned above it will be the first Japanese title fight of the year. This is also the first of the "Champions Carnival" bouts and will hopefully kick off a great of Japanese domestic action.